American Hornbeam, Blue Beech (Carpinus Carolini-ana, Walt. )-Small, shapeless tree with irregular limbs, often pendulous, and, slender, wiry twigs. Dark furrowed at base of trunk on old trees; smooth, bluish grey above, swollen as by veins underneath the bark; twigs brown. Wood light brown, heavy, hard, strong, fine, hard to work. Buds all lateral, ovate, small, brown. Leaves ovate-oblong, long pointed, irregularly doubly serrate, often unequal at base, dull green, pale beneath, orange or scarlet in autumn; hairy petiole and veins. Flowers monoecious, with leaves, in April; staminate catkins, 1 1/2 inches long, pendulous, lateral; pistillate flower; in racemes, terminal loose flowered, with forked red stigmas under green scales. Fruit racemed, hard nutlets in pairs, each supported by a large, leaf-like, 3-lobed bract. Preferred habitat; rich soil near streams, in shade of taller trees. Distribution, Georgian Bay (southern Canada) to Florida; west to Minnesota and Texas; also in Mexico and Central America. Uses: Curious and interesting tree for planting , along watercourses, but rarely seen in landscape gardening. Wood used for tool handles, levers and ox yokes. 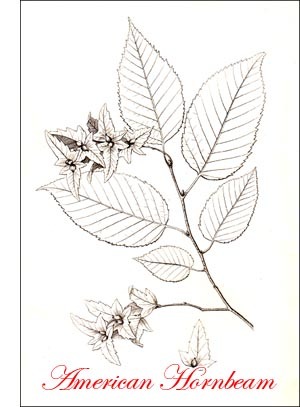 The American hornbeam has no "hop" in its name because its fruit has none. Each little seed in the terminal cluster has a mate on the other side of the stem, and all summer they have grown close together, back to back, generally crowding for more room. Each seed sits in the prow of a little boat, shaped like a red maple leaf, but hollowed like a scallop shell. The wind finally loosens the hold of each, and for j time seed and boat rang by a thread. This breaks at last, and the little nut sails off at the will of the wind, to grow, if it fall-, in � et ground. This hornbeam resembles Ostrya in, ninny particulars-its leaves, its flowers, its delicate wiry twigs, its foliage, and the hardness of its wood. It grows, too, in the shadows of other trees. The bark it is that sets the trees apart. This tree 'has bark like a young beech, a thin, smooth, blue-grey rind, that has strange flutings or vein-like swellings coursing up the trunk and out on the larger limbs. They remind one of the veins of a blacksmith's sinewy arm, or an athlete's. A trunk a foot in diameter at the base generally shows a few furrows, and some minor roughness near the ground, but above, the smoothness is unbroken. The hornbeam grows often in thickets, sometimes as scattered, single trees, in marshy ground and along streams. It is a pretty tree, with blue-green leaves that turn to orange and scarlet in the autumn. It is coming into notice as an ornamental tree, now that people are learning that the best way to make a park is to do less levelling and filling, and plant in the lower ground trees and plants that choose such situations naturally. The anguish of working in this wood was experienced by the early colonists, who appreciated its value. "The New England Prospect" says: "The Horne bound tree is a tough kind of wood that requires so much paines in riving as is almost incredible, being the best for to make bolles and dishes, not being subject to cracke or leake." Heads of beetles, stocks, mill cogs, yoke timbers, levers-for such uses it is ideal wood.